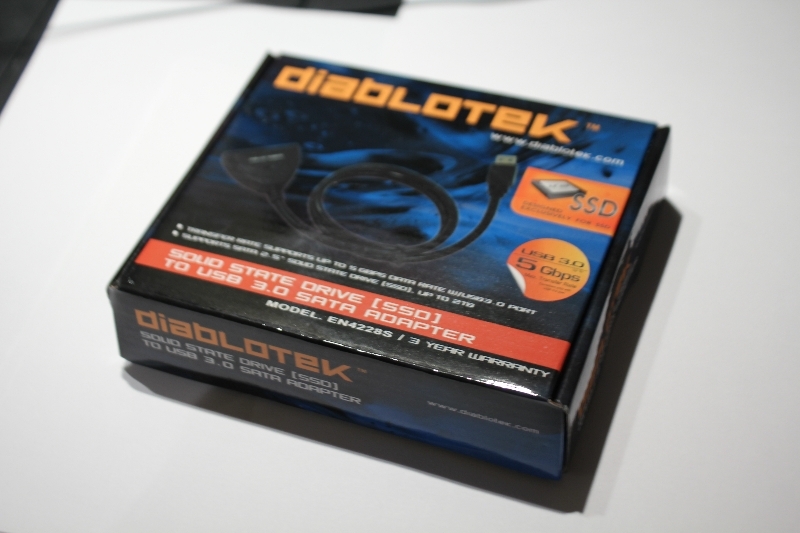 Diablotek brings to the table a small USB 3.0 device that on one end has a SATA data and power connector, and on the other a small standard sized USB 3.0 connector. This device promises SSD speeds across a single USB 3.0 port. With a device, or moreso cable like this we would expect uses to include quick, hot swappable drive use, use in IT / backup or a means to quick and easy offline data storage. The Diablo Tek EN4228S Solid State Drive To USB 3.0 Adapter is the perfect solution to Connect Solid State Drive with a SATA interface to a PC with USB interface. The Diablo Tek EN4228S Solid State Drive To USB 3.0 Adapter is designed exclusively for Solid State Drive. I have a few questions about the Diablotek SSD to USB3.0 SATA Adaptor. 1.) “promises SSD speeds across a single USB 3.0 port” I don’t under stand this. If I plug my HDD into this will it speed it up making it as fast as a OCZ Revo Drive? 2.) Can I use this to boot my computer from? Like lets say I take the drive out of my laptop, can I run my Laptop on my desktop? Will it run faster since it has SSD speeds? I hope you can respond. I’m desperate to get my computers running faster for under $20. 1. Short answer, no. Diablotek has simply promised that their cable CAN support SSD speeds. It will not make your drive any faster than said drives maximum speed. 2. You *should be* in fact able boot a drive off of this cable, however doing so will not somehow turn your drive into a $400 SSD.